This innovative new roll set features a "Barbed Wire" design which can be used to make great looking effects. The top roll is Heat Treated Steel with TiN (Titanium Nitride) Coating. The bottom roll is Delrin (Plastic) with a Durometer of 90. 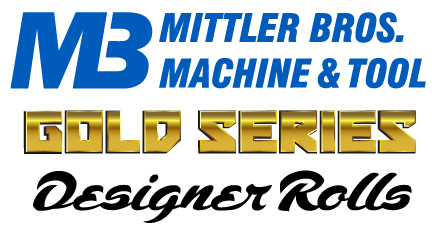 More Gold Series Designer Rolls are in development.